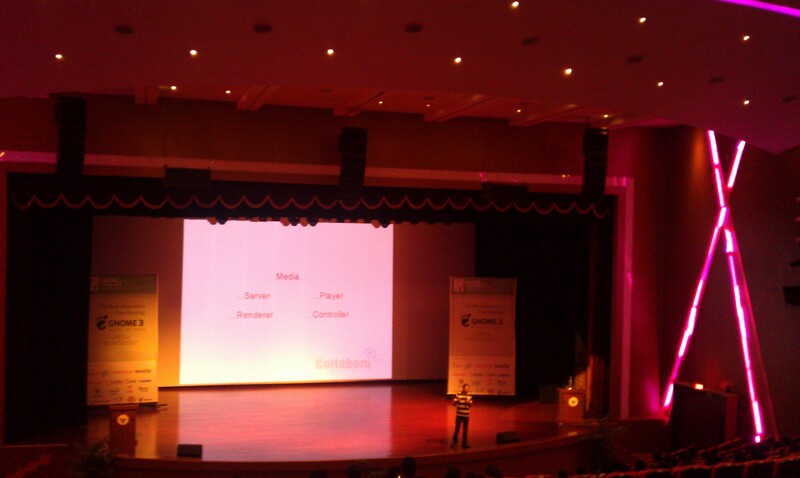 GNOME.Asia was held in Bangalore from 28th March to 3st April. 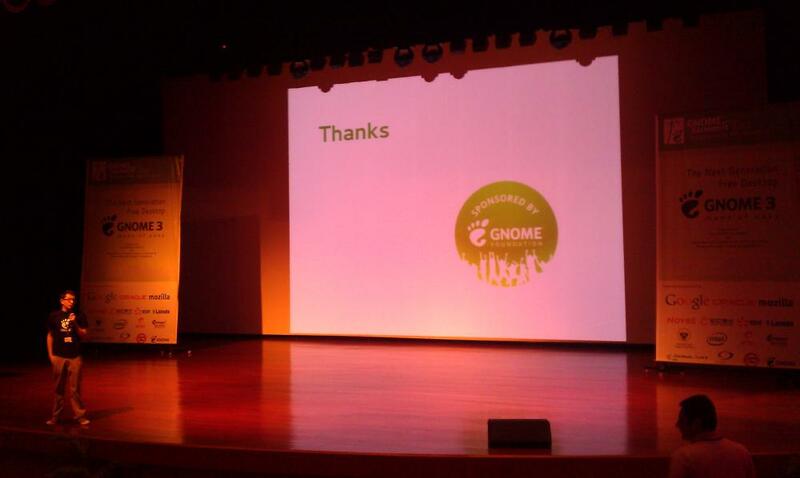 It included a hackfest from 28th March to 1st April and two days of GNOME.Asia summit on April 2nd and April 3rd. As I heard from Manu, the first day turnout was huge. That day India won the World Cup (YAY!). Next day I somehow managed to get up and head towards the venue (only 30 kms from my home). I was one of the few people who reached the venue before 10AM on Sunday. The first session I attended was from Allan Day on Designing the next generation desktop. 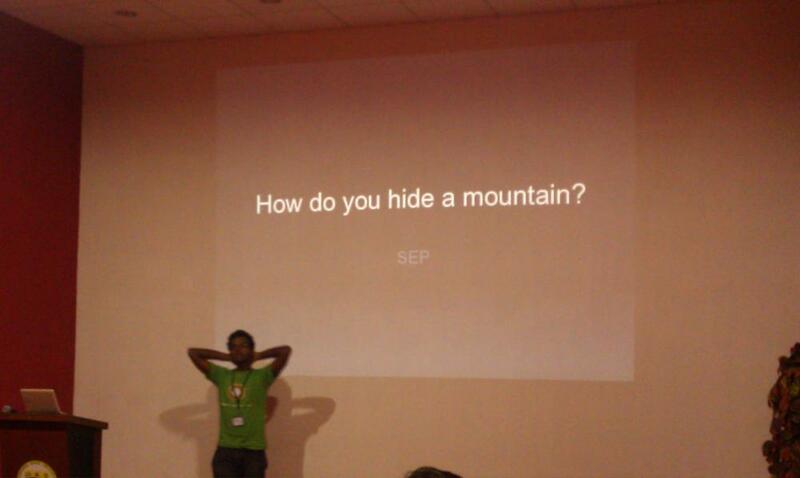 Then I proceeded to another hall where Andre Klapper was giving his talk on Contributing to GNOME Documentation. He had some examples which was more easy to understand than plain talk on concepts and theory. When Yuvi finished his talk, Manu and Sankar were waiting for me outside the hall. This is the first time I met both of them even though Manu is from my college. There were more students from my college – two names I can remember is Vikas and Saurabh. Looks like LUG Manipal bore some substantial results. After these session, I had a golden moment of my life when I went and met Vincent Untz. He is the current Godfather of GNOME. We both talked a bit on Zeitgeist when Allan Day and Andreas Nilsson also joined the conversation for a minute or two before we all moved for lunch. The only two talks I attended in second half was on GDK(entered late so didn’t remember much) and another on DLNA in GNOME3 world by Arun Raghvan. I could not attend any other talk because I came out to talk to our friends when we met after a long time. I got up in the morning only to find there was no electricity. 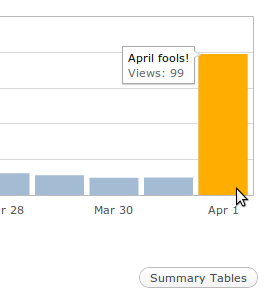 Not sure if this is somewhat related to April Fool prank, but was enough to piss me off. Checked my watch – 9:30AM and the unconference is supposed to start in half an hour! I needed to get ready and travel more than 18 kms. The next one and an half hour involved running all around the house to get ready, gulping down breakfast, hunting for buses and then finally messing up with an autorickshaw driver when he started using his random number generator for determining the fare. Finally I managed to reach the place by 11AM. The event AndroidCamp was of an un-conference style. Upon entering the first bad news I got was that I missed a session on Arduino which went excellent. If Java and XML gives you a hardon, then something is really wrong. Then Kiran told us that the food van had got lost and the driver is circling the neighborhood searching for the venue. How not, even we all had so much of problems locating the venue. During that time Kashif put up a video of Android during Google IO. After the lunch when all of us are supposed to sleep, two sessions caught everyone’s excitement. Since I was in the “Geek” room I missed the Firmware and Rooting talk in “Suits” room. 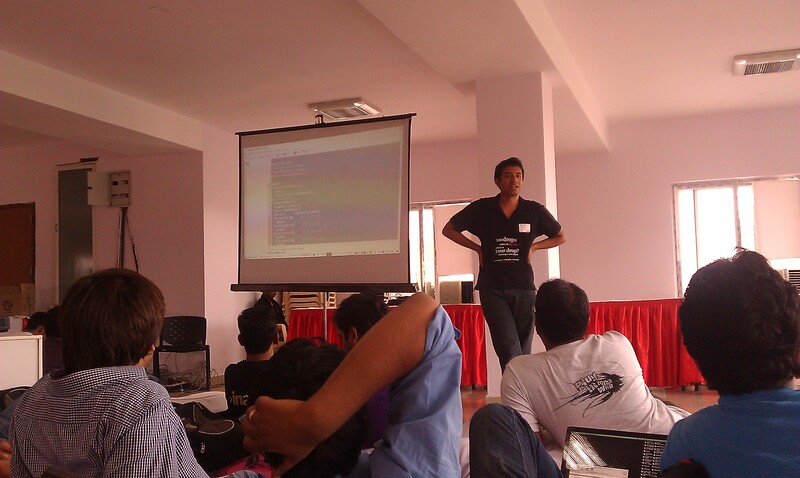 Later two sessions happened in Suits room – “Android-scripting” and “Android Rants”. 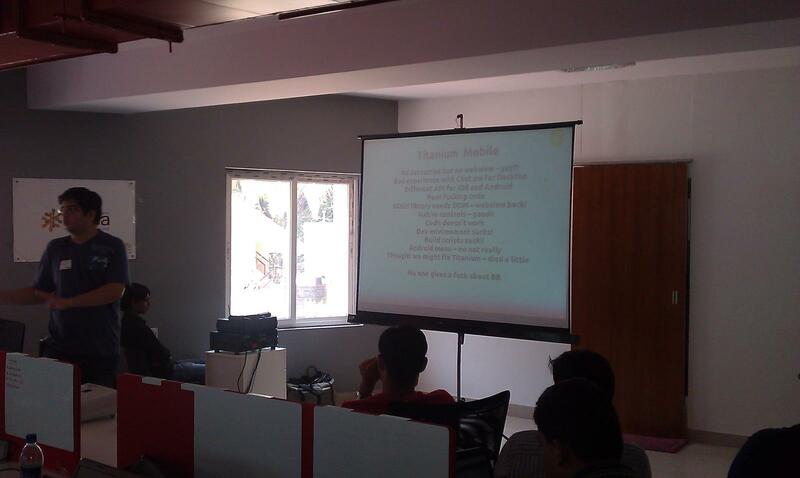 The session android-scripting was taken by Sajjad ‘geohacker’ Anwar. He is the person who works on OpenStreetMap, writes python code and contributes to Ubuntu Accessibility. 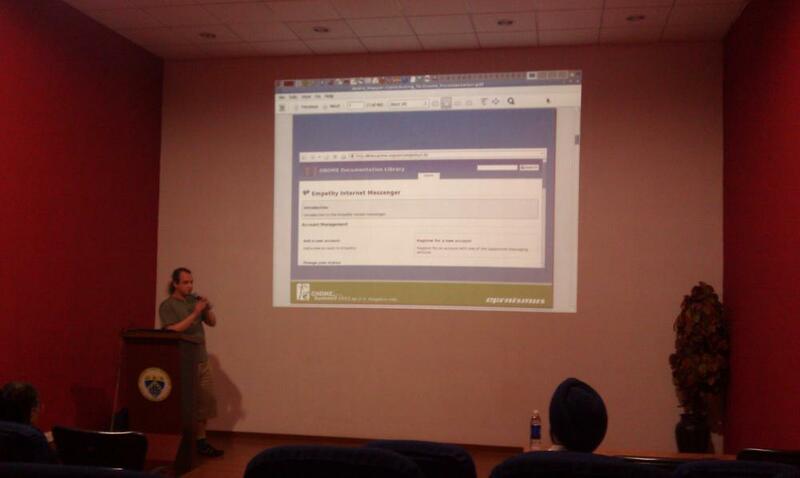 He explained how and when scripting can be useful using python than writing Java code. People put up points about speed, performance of this idea, all of which was answered by him. Good job. I think this was the topic where people took part with utmost interest. Comments came from all the sides of the room. Supreeth had to stop them many times to make sure that the discussion did not turn unruly or offt-topic. I don’t think any aspect of mobile ecosystem was left out during this talk which includes Android, Google, Motorola, iPhone, iPad, Blackberry, Nook, Windows Phone 7, Nokia, Palm, HP and every other entity even remotely associated with mobile phones. The last session was the Feedback session. This was the session where everyone ended up speaking even though I thought that only a few people might express their opinion. The thing most requested was keeping such events on weekends as getting day-off is really tough for most of the people especially when it is Friday.